Mike Vredenburg works with Jake Allstot, a physical therapist assistant, in using legs braces and supports to gain mobility Monday at St. Luke’s Rehabilitation Center in Spokane. He didn’t know where he was. He didn’t know what had happened. All he knew was that he couldn’t feel his legs. “I was scared out of my mind,” said Mike Vredenburg. Moments before he was standing in the middle of a world where everything seemed so still, the deep wilderness in winter. He absorbed every detail of every moment. But now he lay across a berm between a cat track and a hill, his body folded over the snow. He’d flown 30-35 feet off a jump that collapsed on take off, and landed directly on his head, knocking him out and slamming his back against the snow. When he came to his senses, when he looked down at his limp legs, he knew he was paralyzed. He and his friends were snowboarding and snowmobiling in the remote wilderness near Oroville, Wash., a small town close to the border of Canada, where they were staying at a friend’s cabin for the weekend. Daniel Vredenburg, Mike’s brother, and good friend Daniel Howard were there when Mike crashed. It was around 1:30 pm on Saturday, Dec. 29. His brother ran a mile and half back to the cabin, through the deep snow, to call for help. He knew the only way his brother could be reached was by snowmobile. Howard comforted Mike in the meantime. He did everything a good friend would do in that moment. Soon a circle of friends from the cabin formed around Mike. “He’s freezing. He’s shaking,” said friend Ashley Howard. “We all prayed for him. All of us just started singing spontaneously together and the peace of the Lord was so tangible there. You could feel it. There were angels. I have never experienced anything more supernatural in my life and it was the moment of strength we all needed,” Howard added. In that moment, surrounded by the faces of those who loved him, Mike’s mindset changed. Two and half hours, later paramedics arrived on snowmobiles. They carried him out using a sled and took him to the nearest hospital, North Valley Hospital in Tonasket, Wash. It was 5 p.m., three and half hours after the accident. There, the medical staff realized Mike needed surgery and they planned an immediate transfer to Providence Sacred Heart Medical Center in Spokane. They were told weather conditions would prohibit any flights to Spokane, forcing them to drive six or seven hours with Mike in critical condition. His friends prayed for the 20-minute needed break in the weather to fly to Spokane. He was admitted to Sacred Heart where he was operated on the following day. The blow of the impact fractured his spine bone at the waist level, shoving fragments of bone into the central canal through which the spinal cord sends messages from the brain to the lower body. The bone fragments then pinched the spinal nerves, resulting in paralysis of the legs. His surgery served a two-part purpose: It removed the bone fragments from the spinal cord and fused the vertebrae together, using hardware to stabilize the spine and prevent further injury to the spinal cord. “Right after surgery the doctor made it a point to tell me that I’d never walk again,” said Vredenburg. Mike doesn’t buy it. “I totally believe that God’s going to heal me, but in his time. 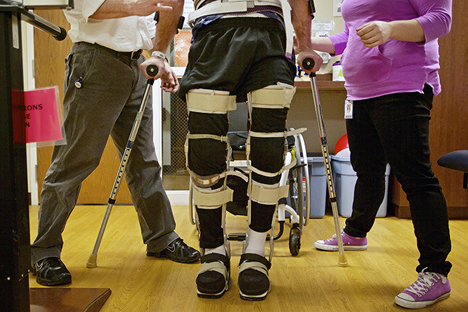 Whether it’s tomorrow or in 25 years, I will walk again,” he said. His friends in Coeur d’Alene didn’t know how to react initially. Vredenburg, 25, was born and raised in Coeur d’Alene. He was a dynamic soccer player for Coeur d’Alene High School and received a full-ride soccer scholarship to NIC. Before his accident, he was serving tables at Applebee’s in Coeur d’Alene and coaching sports at the Kroc Center. When he wasn’t serving hungry patrons, he was serving other people. He and his brother led a Bible study every Wednesday night, as well as a discipleship house in Hayden where they reside with six other Christian men. Pursuing a life of how Jesus lived is a first priority for them. He is an active member of New Life Community Church and the Altar Church of Coeur d’Alene. Rehabilitation Dr. Vivian Moise of St. Luke’s Rehabilitation Institute has overseen Mike’s recovery since he transferred to the center from Sacred Heart on Jan. 3. Mike’s accident, his story, is one of great faith. And that story, he believes, is meant for others. “Mike is doing more ministry right now laying on a bed paralyzed than most people do in their life,” said Ashley Howard, who estimates that at least 200 people have visited Mike in Spokane since the accident. When he was in the ICU at Sacred Heart, they had to rotate different visitors every two minutes. His closest friends slept on the floors and chairs of the hospital’s lobby for almost a week. Sometimes the visitors encouraged him; sometimes he encouraged the visitors. 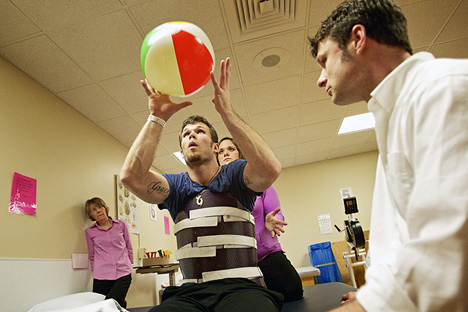 Using a beach ball during a therapy session with Allstot, right and physical therapist Sarah Gross, Mike Vredenburg focuses on keeping his balance and learning how to use a different set of muscles to perform tasks following a spinal cord injury. Mike doesn’t hide his faith. He prays nightly for the hospital’s staff and patients, for his friends and family, for his enemies. Mike drank French press coffee with the nurses and opened up to them about his story. They, in return, confided in him about their lives and their struggles. On other nights, Mike and his friends, sometimes 25 people, gathered in the hospital’s lobby to play worship music and sing together. Even with extensive physical therapy, visits from family and friends, and an ever-growing social media presence, Mike finds time to be still. “I would love people to know that no matter where you find yourself in life, no matter what happens, it doesn’t change that God’s good and he’s for you, not against you. He wants nothing but the best for you and he has dreams and plans over your life that are bigger and greater than your own,” he said. After a month of hospitalization, Mike was discharged Jan. 29. “Is Michael going to be a successful human being in the world, have a career, have relationships, have a family, have children, make a difference in other people’s lives, have a purpose in the world, do whatever he wants to do with his life?” asked Dr. Moise. “Yes. The odds aren’t good. 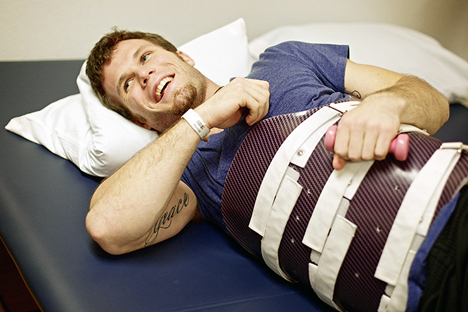 Only 3 percent of patients with a complete injury, like Mike’s, will walk again, said Moise. Mike spoke to Dr. Moise about how much his faith determines his future. Mike admits his life is radically different. What used to take him five minutes to do takes 25 minutes. What he used to do effortlessly takes the most amount of effort imaginable. What he used to acknowledge he now cherishes. JEROME A. POLLOS/Press Using leg braces and forearm crutches, Mike Vredenburg works on his upright mobility less than a month after he suffered a spinal cord injury in a snowmobile accident. 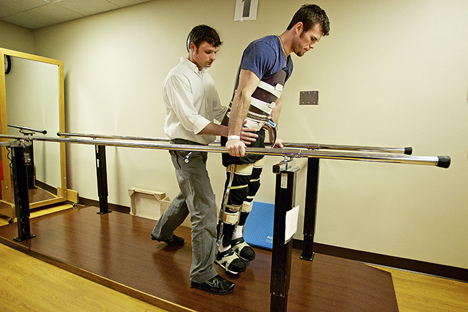 “I haven’t seen a patient progress as fast as him in 10 years,” said Jake Allstot, a physical therapist assistant. Join Michael Vredenburg for “A Night For Mike,” a silent auction fundraiser on Friday, March 22 at the Kroc Center. Tickets are limited and can be purchased by sending a check for $35 addressed to “Mikey V’s Recovery Fund” to C/O A Night for Mike, P.O. Box 658, Hayden, Idaho, 83835. Donate online and listen to Mike V’s video blogs at www.giveforward.com/mikeyvsrecovery.